Shrewsbury's three main shopping centres are expected to cost Shropshire Council in the region of £60m. 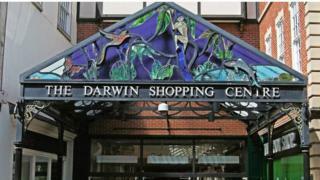 In a meeting, councillors agreed to buy the Darwin, Pride Hill and Riverside centres from UK Commercial Property Trust. The council says the centres will look to provide homes and leisure facilities as well as restaurants and shops. Profits from the deal will be spent on vulnerable adults and children's services, according to the council. Deputy Conservative council leader, Steve Charmley called it a "one-off opportunity to change Shrewsbury for ever". "If you look at the back of the riverside driving down Smithfield Road, it's not the prettiest thing in the world," he said. "This is a one-off opportunity to improve what we have got there." However, Liberal Democrat group leader, Roger Evans said he had a number of concerns about how the project would be taken forward.